Ten years ago this morning, in the Children's Hospital of Philadelphia, Christi exhaled her final breaths as Shayne and I held on to her and told her what an incredible girl she was. While we were thankful that her horrific pain and suffering finally ended, we knew we'd mourn for her the rest of our lives. 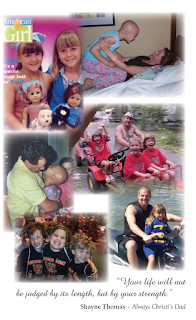 Nothing that I have – not the beautiful and cherished daughter, nor the beloved and adoring husband, nor my loving family, nor my amazing career, nor the marvelous travel adventures I experience – can ever make the slightest dent in the loss of my daughter. But her loss is the greater. Christi had to endure tremendous pain, constant disappointment, and ultimately she had to leave a remarkable sister, family, friends and teachers; her dreams never to be realized. Her life was taken too soon. I think about her every day and some days - usually holidays and anniversaries, are much worse than others. I often wonder what Christi would be like at 19 and if she really knew how loved, important and treasured she was. For those of us who wear this invisible badge – the parents of dead children, our grief never ends. Over the past ten years, I've learned each person trudges along his or her own solitary path. The blight of losing a child is different for every person afflicted. I've experienced a wide range of emotions. I still sometimes struggle with sadness and anger, and find myself envious of parents who have healthy children, especially when those children don't appear to be wanted or well-taken care of. I know envy and anger are horrible emotions and ones I never experienced until Christi was diagnosed with cancer, but they still overwhelm me at times and I blink away tears trying to deal with it all. And although Shayla has blossomed into the most incredible, intelligent and loving 17-year old gal, she struggles too. Despite her outward appearance and decision to have a positive attitude and sunny disposition, I know things aren’t always bright on her inside. I'm thankful Shayla is still that same beautiful soul with a heart of gold who jumped into my arms, buried her head in my shoulder and sobbed ten years ago tonight after we made the ten hour drive home and told her that Christi didn't pull through this time. My heart breaks that Shayla doesn't have a sibling. Next to Christi suffering the ultimate, Shayla suffers the greatest loss. I find myself trying to shield and protect her from the pain when people talk about doing something with their sister/s, something Shayla will never be permitted to enjoy or grow old with. Sadly and shockingly, the survival rate for stage IV neuroblastoma when diagnosed over the age of 36 months, has not improved since Christi was diagnosed 14 years ago this month. It is still a death sentence. 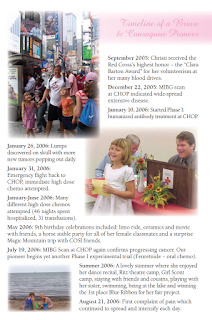 Last week Shayla wrote an essay and I will share a part of it: “The reality is over the past thirty years only three new drugs have been approved for use in treating childhood cancers, compared with hundreds of drugs developed for adults. This disparity results from a profound lack of funding. Pediatric cancers receive less than 1% of government funding for the NCI (National Cancer Institute) and in the private sector, pharmaceutical companies have little incentive to develop treatments for children.” Therefore, I write -- If you have a few extra dollars and find it in your heart to give, please consider donating to one of our family's favorite causes for research for pediatric cancers, Alex's Lemonade Stand. 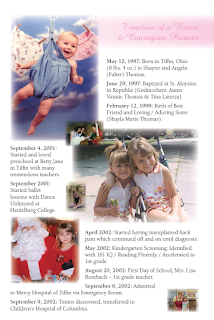 Ten years ago this morning I gathered Christi's things and made a social worker promise me she would not to leave Christi's lifeless little body until the funeral home workers came for her. Then we cleaned out our room at the Ronald McDonald House, donated Christi’s awesome special stroller, and drove home from Philly. I remember stopping for a bathroom break and we made ourselves buy a sandwich to split knowing we had a lot to do and needed food even though we couldn't imagine ever being hungry again. As I stood and held the door open for people coming out of the fast-food establishment, I remember thinking, "They have no idea my daughter died a couple of hours ago and I'm standing here holding the door for them, trying to smile. This is just crazy." Today, please do a random "Christi Kindness". 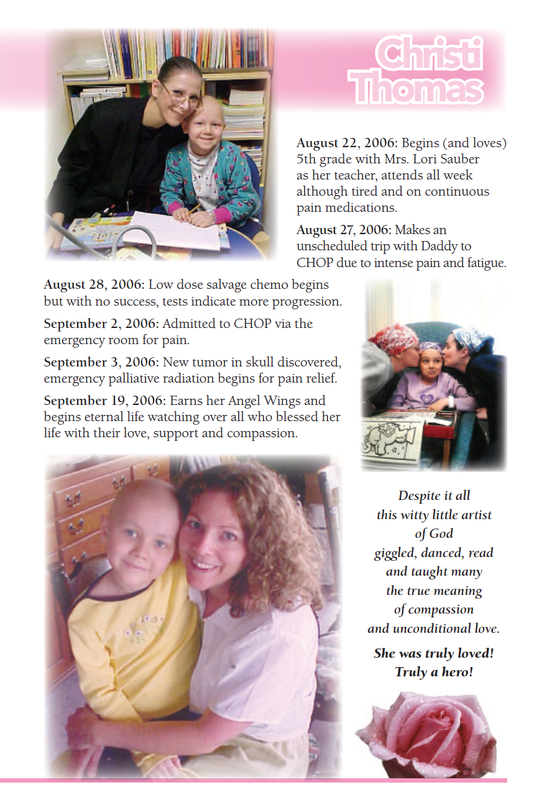 This was something talked about at her funeral based on the fact that even though Christi was fighting a terminal beast, she would often to do things for the "sick kids" -- taking them art projects, reading them stories, or giving them drawings she made to make them happy. Despite not feeling well, as she often felt, she still wanted others to smile. Let's all try to do a random "Christi Kindness" today in honor of a brilliant little blonde with an infectious smile and laugh, and with whom I hope to reunite with this precious little soul in a much better place one day. May God watch over and bless everyone. 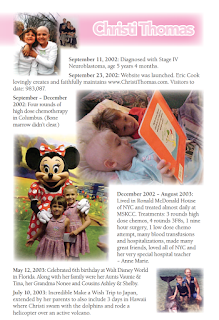 Thank you for loving Christi – and all of us! 10 years later, we still will never forget Christi. Cécile, from France. I follow you since many years, when I don't fell fine I enjoy reading your blog, you all have a so big hearth. Sorry if I don't speak very well. I don't know if you remember, I wanted to be a religious woman in Carmel but I need to work to earn my life. I go in a monastery of Clarisses (sisters of St Francesco) & pray for your family. Hope Shayla feels fines and you Angela and your husband Shayne. All of you are often on my mind. I cannot believe that it's been ten years without your awesome girl. Shayla, you're especially in my thoughts this time each year. I am a sister, too, and I hope you always remember that Christi loved you like nobody else AND she knew - without a doubt - that you loved her the same. I am sure that she'd be proud to see the person you are becoming! Angela and Shayne, she'd be proud of you as well. The grace with which you have handled your unimaginable loss is an incredible thing to behold. Christi knew she was cherished, but I am profoundly sorry that you were robbed of a lifetime of telling her so. Just wanted you guys to know that Christi will never be forgotten! I've thought so much of you and Christi on Monday and throughout the week. Christi and her story touched me deeply. I can easily remember the moment ten years ago when I pulled up the blog and read that she had died. And to this day I will still think of wonderful moments you have shared, like photos of Christi excitedly lacing up her first pair of pointe shoes or her joy at having a kitten snuck into the hospital for her to cuddle and play with. I've never commented on your blog before although I've read and followed it faithfully since 2004 or 2005. 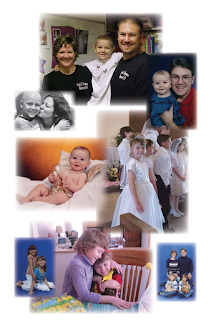 I've also followed many other children and families fighting the beast that is childhood cancer, and each story is compelling and heartbreaking. Yet yours is the only family I have followed continuously for 10+ years; Christi's is the only death I remember learning of so clearly and still remember each year. I suspect part of the reason may be because you remind me in many ways of my own family. 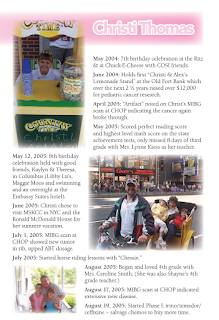 I say all this to attempt to illustrate how much Christi and all of you inspired and affected me. I hope it brings you some small measure of comfort to know that your incredible Christi is still fondly remembered by a stranger across the country. I've made a small donation in her honor to ALSF, and I hope in the future I can make more substantial contributions. May your entire family continue to enjoy all the happiness and wonder to be found in a world without your wonderful Christi. I still think of your family, and Christi, often. I am so sorry that she had to leave 10 years ago. What a day it will be when you are reunited in heaven. I found your daughter's web page and this blog after searching for information about Neuroblastoma. 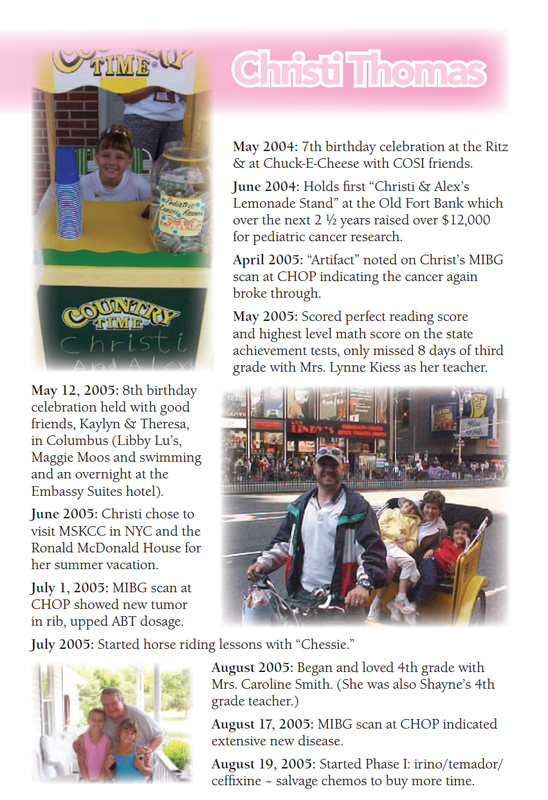 I am trying to hold back tears as I read all about your amazing family and your brave daughter, Christi. You did an awesome job of sharing her life via the web site & blog. Thank you. My 2 year old grandson was diagnosed with low risk Neuroblastoma one year ago. The tumor was found when he saw a pulmonologist for pneumonia. The Doctors said they are so thankful he had pneumonia - and that a case such as this one rarely happens. I never heard of this type of cancer before and now I am trying to educate everyone in my circle of life about it. 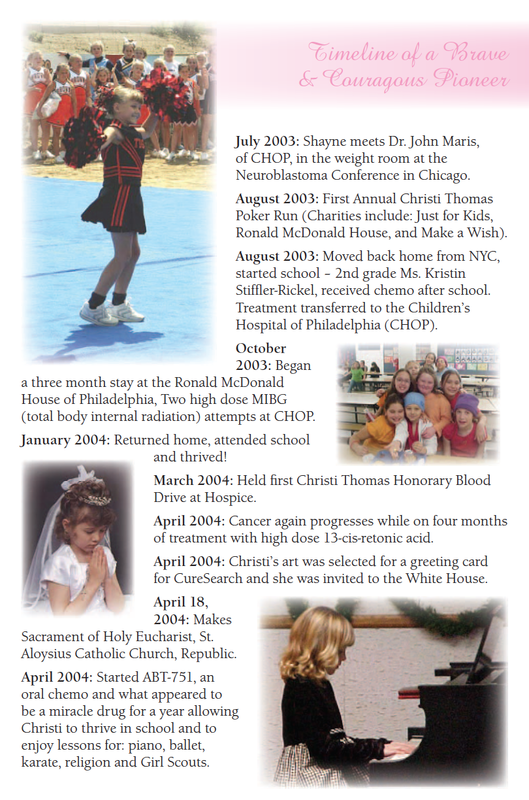 Keep up the great work, I am so grateful for your webpage and for all you all have done to bring awareness to Neuroblastoma. I am so sorry for your loss, I see Christi's beautiful smile in the face of her sister. You don't know me.... but back in the day I contributed some information to Christi about ragdoll cats for her cat project, I think it was 4H that she was doing. You and I were getting our PhD's at the same time and I don't know how I ever ran across your blog of Christi. I followed every update and cried when she left you. I hadn't checked back until today and I don't know why I have been thinking of her so much lately but it is hard to believe that it has been 10 years. Shayla is all grown up from the last I remember and it is good to see that you guys are all still happily together which is so rare for so many families who experienced the loss of a child so congratulations. Just know that I, who you don't know, was thinking about you and rooting for you all and happy to see you all happy. I will always remember Christi and thank you for sharing her with so many. She was an inspiration, and her good works live on in the many people who were touched by her story. are going to definitely use a lot of this! I will always remember Christi and thank you for sharing her with so many.